Intermediate all-solid propellant Chinese launch vehicle. 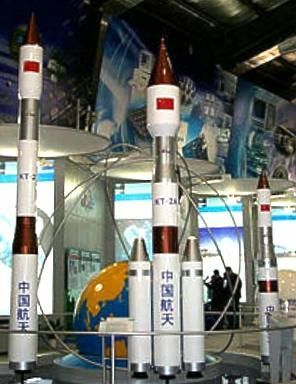 Model first displayed at Wuzhai in the fall of 2002. Evidently consists of new large diameter first stage motor, topped by the first two stages of the basic KT-1 vehicle. All figures are rough estimates. AKA: Kaituozhe-2;SLV-2. Status: Development ended 2002. First Launch: 2017-03-02. Last Launch: 2017-03-02. Number: 1 . Payload: 800 kg (1,760 lb). Gross mass: 40,000 kg (88,000 lb). Height: 35.00 m (114.00 ft). Diameter: 2.70 m (8.80 ft). Apogee: 500 km (310 mi). LEO Payload: 800 kg (1,760 lb) to a 500 km orbit at 98.00 degrees. Family: all-solid, orbital launch vehicle. Country: China. Agency: KT, Space Solid Fuel Rocket Carrier Co Ltd.